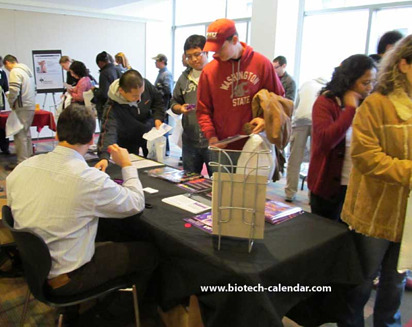 Biotechnology Calendar, Inc. invites science researchers and lab suppliers in the state of Washington to attend our annual Pullman BioResearch Product Faire™ Event at Washington State University, Pullman this October 22, 2013. Biotechnology Calendar, Inc. trade shows are an easy way to generate scientific product sales leads, and our life science sales and marketing events are a great way to get the word out on new university lab products. Washington State University, Pullman has a number of life science research departments that are in need of university lab products. Some of the more specialized life science research departments at Washington State University, Pullman include biological chemistry, reproductive biology, muscle biology, veterinary microbiology and pathology, and crop and soil sciences. There is also a great deal of NIH and NSF research funding available at Washington State University, Pullman, making the Biotechnology Calendar, Inc. life science sales and marketing event at the university a great way to generate scientific product sales leads. In 2012, the NIH gave Washington State University $19 million in research funding, while the NSF gave the school $21.9 million in research funding. Biotechnology Calendar, Inc. encourages lab suppliers and biotechnology vendors to take advantage of this life science sales and marketing event in Washington by attending the Pullman BioResearch Product Faire™ Event this coming October. Biotechnology Calendar, Inc. is a science research marketing and event-planning company that helps lab suppliers market university lab products and take advantage of the scientific product sales leads they receive at our shows. If you are a lab supplier interested in attending an event closer to home, we encourage you to check out our 2013 calendar of events. For more funding information on Washington State University, Pullman, click on the button below. For Pullman BioResearch Product Faire™ Event special offers, click here.